Swimmer Helen Smith was crowned champion of the first open water swimming event in northern Europe’s largest man-made lake today (Sunday September 7). Helen, aged 20, from Devon and currently living in Liverpool city centre, joined more than 100 people who took part in the inaugural event at Kielder Water & Forest Park, Northumberland. The Liverpool University student, who only decided to take part last week, completed the 10k race across Northumbrian Water’s giant reservoir in 2 hours 33 minutes and 18 seconds. Other distances on offer were 3.8k ‘iron’ distance and the classic one mile. 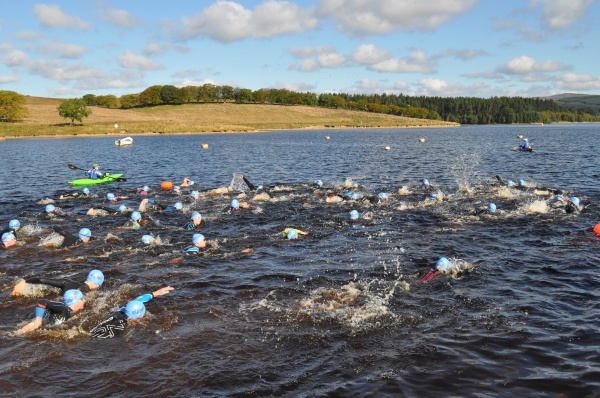 The 114 swimmers braved temperatures of around 15 degrees Celsius and depths of up to 170 feet (52 metres) in Kielder Water, which holds 2.5 billion bathfulls of water. Liz Sidebotham took part in the 3.8k swim to raise money for Northumbrian Water’s adopted international charity, WaterAid. She said: “I completed the race in 1 hour and 33 minutes and I’m really pleased with my time. The swimmers were presented with medals by Olympic Medallist and former World Record Holder, Jo Jackson. Jo said: “I’m delighted to be in this beautiful location, supporting the swimmers at Kielder’s first dedicated swimming event. It’s a unique opportunity to get into the water here as swimming is never allowed under normal circumstances. It is a very deep and very cold, dangerous place to swim, but this was a special event organised by professionals, Vital Events.